Acta Stomatologica Marisiensis is an international journal dedicated to publishing high-quality peer-reviewed articles about all fields of dental medicine. The important topics covered by the journal refer to the complete, complex and interdisciplinary treatment of the patient with dental problems. This involves addressing all branches of dental medicine and does not exclude research in the field of nanomaterials, biotechnology or medical engineering. By focusing on the publication of new documents and evidence of high quality research, Acta Stomatologica Marisiensis aims to improve the practice of dental medicine at the clinical and research level at an international level. The journal focuses on the publication of quality medical research articles that bring new insights into dental medicine from the perspective of diagnosis and treatment methods and the materials used. No less important are presentations of interesting clinical cases that can bring new light into diagnostic and treatment methods or interdisciplinary therapeutic approaches or collaborations with various fields of engineering for the development of innovative new technologies. Acta Stomatologica Marisiensis addresses the entire community of dental specialists or related specialties at national and international level and aims to provide studies and materials for a better understanding of diseases and treatments in the sphere of dental medicine. The Journal emphasis is primarily on original high-quality medical research but also accepts manuscripts relating to the basic sciences, review articles, systemic reviews and meta-analysis, case reports, and observational studies of all types, including randomised control trials, editorial commentary and opinions covering the entire spectrum of research in dental medicine. The role of the Journal is to inform its readers of ideas, opinions, developments and key issues concerning dental medicine, stimulating interest, debate and discussion amongst dental medicine colleagues and those of related disciplines. 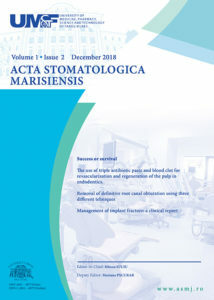 Acta Stomatolocica Marisiensis has institutional support from the University of Medicine and Pharmacy Tirgu Mures, the owner of the journal.